The UN Security Council voted on Tuesday to impose an arms embargo on leading members of the Houthi militia as well as Ahmed Ali Abdullah Saleh, the son of former longtime dictator Ali Abdullah Saleh. The resolution was passed with 14 votes in favor and Russia abstaining. 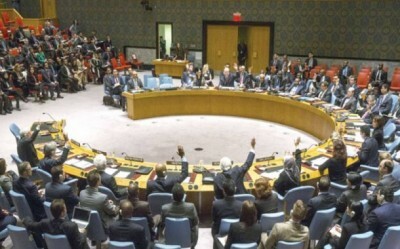 The text of the embargo was drafted by Jordan, a nonpermanent member of the Security Council. The Jordanian monarchy is actively participating in the anti-Houthi air assault in Yemen being spearheaded by Saudi Arabia. The Salehs have given support to the Houthi militia that seized control of Yemen’s capital in September, ousting President Abd Rabbuh Mansour Hadi and placing him under house arrest. Hadi fled for the southern port city of Aden in February before leaving the country in March for Saudi Arabia in the face of a Houthi-led assault on his compound. While the Security Council resolution calls for the Houthis to “immediately and unconditionally end violence,” it says nothing about the airstrikes being carried out on a daily basis by a coalition of Arab Gulf States headed by Saudi Arabia. Since March 26 Saudi coalition air forces have launched more than 1,200 airstrikes against targets throughout Yemen, with some strikes killing scores of civilians. A bomb dropped on the Al Mazraq refugee camp in northern Yemen on March 30 killed at least 30 civilians. An airstrike on a dairy factory in the port city of Hodeida on April 1 killed at least 37 workers. The Saudi monarchy, with US backing, has launched a widespread air assault against Houthi-controlled military targets as well as major urban areas. Street fighting in Aden between Houthi forces and armed forces opposed to them has left hundreds dead and hundreds more wounded, littering the streets with corpses. Hussein noted that coalition airstrikes have hit residential areas and homes throughout the country, including in the provinces of Taiz, Amran, Ibb, Al-Jawf and Saada. An airstrike that hit a residential area in Taiz on Sunday killed ten civilians and injured seven others. Schools and hospitals throughout the country have been damaged or destroyed by airstrikes. Eight hospitals in the provinces of Aden, Dhale, Sanaa, and Saada have been hit by coalition bombs. Speaking to Al Jazeera on Monday, Ivan Simonovic, UN Deputy Secretary General for Human Rights, warned about the growing humanitarian crisis in Yemen, saying that a majority of those killed so far have been civilians. “Over 600 people killed, but more than half of them are civilians.” Of the civilian deaths counted by the UN, at least 84 have been children and 25 were women. While the United States has provided intelligence and logistical support to the Saudi coalition from the onset of the assault, it has been gradually increasing its involvement in the conflict. American imperialism has long sought to maintain its control over Yemen, which lies next to the Bab-el-Mandeb Strait, a major oil choke point. According to the Wall Street Journal, the Obama administration has a direct hand in the selection of targets for airstrikes. Pentagon war planners at a joint operations center are directly approving every target selected by the Saudi military. The US military planners also provide the Saudis with the specific locations where they should drop the bombs. “The United States is providing our partners with necessary and timely intelligence to defend Saudi Arabia and respond to other efforts to support the legitimate government of Yemen,” Alistair Baskey, White House National Security Council spokesman told reporters on Sunday. US warships stationed off the coast of Yemen in the Red Sea have also begun assisting the Saudi-led coalition in enforcing a blockade of the country. On April 1, US sailors boarded a Panamanian-flagged ship in the Red Sea in search of weapons supposedly bound for the Houthis. The search did not turn up any weapons. American drones continue to fly over Yemen in support of Saudi operations against the Houthi militia and the targeting of members of Al Qaeda in the Arabian Peninsula (AQAP). An apparent drone strike on the southeastern port city of Mukalla Sunday killed senior AQAP leader Ibrahim Al Rubaish and as many as six other people. Rubaish, a Saudi national, had been held at the Guantanamo Bay prison camp from 2002 until his release back to Saudi Arabia in 2006. He reportedly fled to Yemen in 2009 and joined AQAP, and the US recently placed a $5 million bounty on his head. While neither the CIA nor the Pentagon have claimed responsibility for the attack, it was likely carried out by the US, since Mukalla, which was seized by AQAP fighters earlier this month, has yet to be targeted by Saudi airstrikes. If confirmed, the attack would mark the first US drone strike in Yemen in nearly six weeks. It has been three weeks since US Special Forces evacuated the Al Anad airbase north of Aden. Al Anad had served as the main hub for the officially secret American air war, which has killed more than 1,000 people in Yemen since 2009. Meanwhile, both Saudi Arabia and Egypt are actively preparing a possible ground invasion of the country. The Egyptian military dictatorship reported that it and the Saudi monarchy are discussing a “major military maneuver” along with other Gulf states in the coming days.